Crossing the High Atlas to the Sahara from Marrakech requires detailed planning to experience the region’s full beauty and history. This convenient tour wraps them up in three days, with a guide to make everything extra engaging. 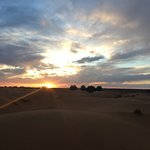 Navigate Tizi-n-Tichka pass to Ait Benhaddou and the movie town of Ouarzazate, plus ride camels and stay overnight at a bivouac camp in the Sahara’s Erg Chebbi dunes. Includes transport, accommodation, and convenient Marrakech pickup and drop-off. After pickup in Marrakech, venture through the High Atlas, navigating Berber villages and the Tizi-n-Tichka pass to visit Ait Benhaddou kasbah. Following lunch (own expense), continue to Ouarzazate where you can explore Atlas Studios, Africa’s biggest movie studio, and Taourirt kasbah, a former Glaoui Dynasty stronghold. 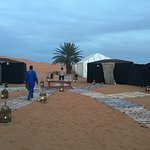 Then, travel via the Skoura Oasis and Amerhidil kasbah to the Rose Valley. After breakfast, walk through the Todra Gorge before heading towards the Erg Chebbi Desert. On route, take photos of Tinghir’s palm groves before a stroll beside the Todra River and a mint tea. 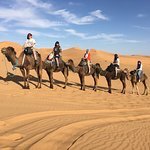 Then, pass the Anti Atlas on the way to Merzouga and Erg Chebbi’s dunes edging the Sahara, where you’ll ride a camel and overnight in a bivouac camp, with dinner and drum music under the stars. Wake up early for the sunrise and a mint tea before a camel ride to a kasbah hotel for breakfast and a shower. Then, return through the Atlas Mountains to Marrakech, where your adventure ends at the original departure point. Amazing experience to cherish always! 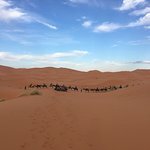 Get quick answers from Moroccan Desert 3-Day Tour from Marrakech staff and past visitors. Is there an option to stay in a private room and bathroom when starting in the bivouac? Are there power sockets available in both lodgings? Hi, the first night at the hotel in the Atlas Mountains there is a power outlet. Also you’ll have a chance to charge up at the hotel you stop at before you go in the desert (the hotel is just a stopping point, you don’t stay there). You should take a portable phone charger overnight in the desert, no plugs. I think they have solo tents, not sure. There are two toilets, one sink, not private. The toilets feel like regular bathrooms. Have fun! We were able to take with us all our luggage. It is better to check with the company that organizes it though. Check your booking information; you will probably meet at a designated location.